During a three-day day survey of La Presita, El Salvador, January 2008, our team found an economically active community that is considered desirable to live in, whose properties have high value, with a strong and successful built environment. It continues to provide affordable and high-quality housing for original families; however, this same affordability does not extend to new buyers. We also found the community struggling with gang activity, a lack of financing to improve or maintain infrastructure, poor service and political governance from the municipal level, and properties left vacant by out-migration. We also found that the social organization of the community, strong at its founding, has eroded over the years. What follows is an overview of our visit and general profile of the community, as well as a description of our impressions related to four topics: construction and materials, urban design and infrastructure, social organization, and household finances. We conclude with what we see as opportunities for interventions in La Presita or to consider in the planning of future such projects. Prepared by Molly Eikerdt, with Alexa Rosenberg and Danielle Martin, drawing on information from survey teams. 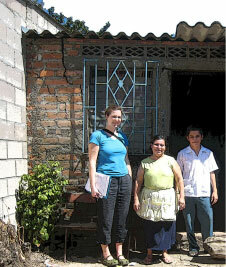 This three-day survey of the community of La Presita in San Miguel, El Salvador, was part of a SIGUS (Special Interest Group in Urban Settlement) Workshop during the Massachusetts’ Institute of Technology’s Independent Activities Period in January 2008. One objective of the two-week workshop was to become familiar with residential construction in the planned low-income community of La Presita. (The second objective of the Workshop was to design and complete a building project in partnership with pre-natal clinic in a province north of San Miguel. This is where we spent the majority of time during the two-week visit. Fourteen students from the School of Architecture and Urban Planning at the Massachusetts Institute of Technology participated. ) We sought to understand and document the process by which the community was formed and the steps families took to build their houses. The long-term perspective relied on the memory of the families to relay their own building techniques and impressions of the process. Two organizations facilitated the visit in La Presita over January 21-23, 2008 (Tuesday- Thursday). 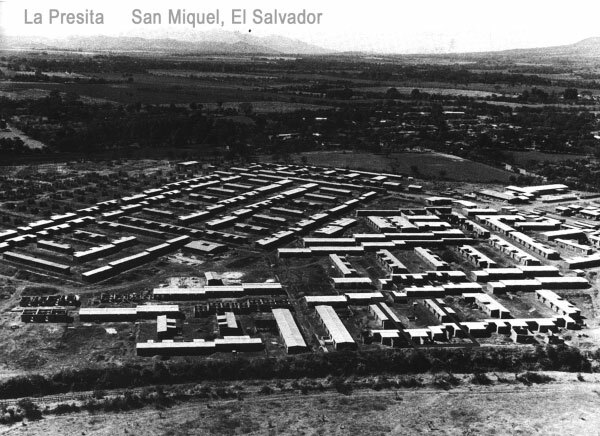 The first was Fundación Salvadoreña de Desarollo y Vivienda Mínima (Salvadoran Development and Low-Cost Housing Foundation) or ‘Fundasal’ as it is popularly known. Fundasal was responsible for developing La Presita in the mid-1970s. The second organization that facilitated the visit was the leadership body for the community, La Directiva, an elected board responsible for social activities, communication and organizing within the community. We met with three senior program staff from Fundasal on the first day of the visit. They gave us a history of Fundasal’s projects throughout the country, their evolution as an organization and the particular planning and development of La Presita. The first day also included an introduction to la Directiva, where we heard about their current projects and shared the objectives of our visit. The following morning, four teams made eighteen home visits. During each visit, team members filled out a questionnaire with the help of the household head, made measurements and architectural sketches and took photographs, all to document each house and its construction. One team made audio recordings of their interviews. The teams consisted of three or four students, one representative from Fundasal (three of the teams) and at least two representatives from la Directiva, who identified the houses where the group conducted interviews. The survey was intended to be a sample of the following: different levels of house improvement, zones within the community, street types (cul-de-sacs, pedestrian ways or main streets), or original house and site type. Selection of houses was biased in favor of households who had relationships with la Directiva representatives, those who were home during the day with home-based businesses, and those who elected to participate in an interview. Materials completed for each interview (questionnaires, sketches, AUTOCAD drawings and photos) have been archived on the School of Architecture’s server. (SOAP/Architecture/Classes/ElSalvadorWorkshop/LaPresitaDocumentsandPhotos/HouseSurvey.) The reader should note that these eighteen interviews represent a limited sample of the 900-some households in La Presita and may not be fully representative. On the final day of the visit, we hosted a meeting with La Directiva to which we invited the households that were interviewed, as well as other residents. Over fifty people were in attendance. Many were elderly women. The purpose of this meeting was to present our impressions and to generate discussion among residents about how their community was developed and the issues it faces today. The presentation was centered on themes of construction/design, economics and social organization in the context of the past, present and future. La Directiva has an interest in reflecting on the successes and undertaking strategic planning on the occasion of the community’s 30th anniversary this year. We have distributed our notes and photographs from the visit to la Directiva. Had our group had more time in the community, we would have likely spent a full week conducting surveys and more closely examining the differences in household construction and development by original house type or street type. La Presita was a “site and services” housing project that provided buyers with lots and utility service and where building of a starter core was largely undertaken by individual households in twenty-five cooperatives, each consisting of 15-20 families each. Fundasal, with funding from the World Bank, was responsible for site design and development, as well as qualifying, providing financing for and organizing residents for the system of mutual help (ayuda mutua) construction. La Presita became well-known among international housing developers in the 1970s for the revolutionary ideas that it demonstrated: the initial site and services package, the particular design of the starter core, the use of mutual aid construction to teach skills, the building standards it set, and for fostering a unique spirit of community cooperation. It was one of the first of the new housing paradigm promoted by the World Bank. La Presita’s greatest development legacy is that it allowed very low income families who would not otherwise have been able to afford housing, to build a house over several years that would otherwise be available only in a higher-income neighborhood. Over the course of thirty years, individual households in the community have been able to expand and improve their dwellings to create a secure, debt-free asset, that houses both nuclear and extended family. While La Presita has enjoyed many successes, it faces challenges as well. Many houses sit vacant, as owners or heirs live outside of El Salvador and continue to hold title. There is, however, market value in the homes, residents estimate that about half of the homes have turned over from their original ownership, whether through sales or rental arrangements. Ongoing challenges also exist with community-wide infrastructure; the community never implemented a sewage treatment system and raw sewage still empties into the adjacent river. Public amenities are not well maintained; La Directiva has struggled to fund improvements to a playground and to keep open space planted with trees and free of litter. The condition of public spaces may be an indication that maintenance is overwhelming or impossible without municipal services or funds, (maintenance of public spaces was originally envisioned as a partnership with the municipality), or it may be a sign of a lack of community pride. We would guess that conditions are more a function of the former rather than the latter. There is a considerable gang presence in the community, and residents related that the northern section of the community controlled by a gang, though violence within the community itself is relatively minimal. According to Fundasal staff, La Presita has a reputation for gang violence and poverty outside of the city of San Miguel and throughout El Salvador. At the original stages of the community’s development, the ayuda mutua construction built the core and sanitary units without finishes. Houses were completed over time by the homeowners. Ayuda mutua also was responsible for some pedestrian walkway paving, storm drains and other minor common "public" works. Interior finishes and services, as well as exterior components of the homes such as walls and gates were completed by individual homeowners. The difficulties with the ayuda mutua construction process that residents mentioned in retrospect were distance of the site from where most people lived and the time and effort it took to get there on a daily or weekly basis to work, the lack of machinery, and the opportunity cost of family members working on the core units rather than working at a paying job. Some families even hired a laborer to make up the required number of hours that each family committed to provide. The majority of the houses that we visited had been improved in some way beyond their original construction, even those that were originally developed as apartments. Thirty years after moving in, most owners are still making improvements or express a desire to continue to make improvements of some kind, especially expanding to a second floor, or upgrading bathrooms. Primary motivations for upgrading include the need for more space, the need to accommodate a business, and to make the house more structurally sound to protect against earthquakes. If families have money, they will invest in expansion for the sake of comfort and status. One woman explained that she kept adding on to the house out of a desire to have a “complete house,” having space to entertain visitors in addition to private space. Before visiting the community, we made the assumption that the expansion of the house may have been triggered by family expansion, but found that building expansion occurred without any direct pressure from family growth. Expansion occurred most often when families acquired some source of funding, most commonly a large one-time source, such as funds remitted from a family member living in the United States (often an adult child or a sibling) or the receipt of a life insurance policy. We also met people who had very slowly expanded their houses, room by room, with savings they had put away. This suggests that families went for years without making needed improvements because of a lack of funds. Many completed large improvements to their house in the mid-1990s, following the end of the Civil War in 1992. Aerial view during construction, ca. 1979. Note the clustering of units around a shared open space.In making major improvements, some built around the original mutual starter core house and others demolished it to build a new structure in its place. It seems that the original structure did not have the structural ability to support second story construction or to withstand earthquake damage. Though Fundasal and the site and services rhetoric invokes a sense of “self-construction,” outside of the original stages of construction, many families hired professional contractors or masons, at considerable cost, to do some of the work on their house, because of the time and the skill that the work entailed. This was especially true for women homeowners. Once a family was able to hire someone, major construction on the house could be completed within a couple of weeks. Most families purchased materials themselves from businesses in San Miguel. Homeowners stated that they didn't have problems with the technical aspects of the plumbing, only that the cost was often burdensome because they had to break through cement floors to remove and reinstall pipes. Those who added to their houses incrementally had awkward or inefficient systems, such as overlapping and leaky roofing, or complicated plumbing. From the original house form, most households made improvements toward the front of the property, adding a kitchen, finishing or expanding a room, making space for a business, before making improvements toward the back of the property, adding rooms to the back or adding a wall to enclose the property, for example. Some of the most fully developed houses we visited had two stories, with full bathrooms and kitchens, as well as washing machines and dryers. We were not able to undertake a comparative analysis of original housing types, but those with the original “L” type expressed trouble with hearing the noise of neighbors and difficulty with roof expansion. Most houses built in the ayuda mutua stage used brick construction, but those making major additions since then have used concrete block if they can afford it, preferring its higher quality. Walls are most often constructed with reinforced concrete post and beam construction with brick or block infill. Ceilings are generally high (over 12-14’) to allow for better air circulation. Often the interior walls are plastered and painted, though in some the masonry remains exposed. In almost all houses a course of perforated breezeblock runs along the top of the walls to allow for light penetration and ventilation. Flooring largely uses cement tile or concrete slab, and the poorest houses had only dirt floors. Many houses have small tiled courtyards in the front. Roofing is structurally supported with a steel rebar “C” channel truss. Roofing material is generally fiber cement corrugated roofing, of which some pieces were translucent to let in light. Windows are generally standard glass louvered windows with ornamental steel security bars. Front and back doorways commonly have an ornamental steel outer door to allow the family to keep the door secured, while letting in light and air. Nearly all houses have outdoor courtyards behind their house, whether it was part of their original lot or they informally annexed a public “green zone.” Courtyards included much vegetation: mature shade trees or fruit trees including mango, avocado, orange and papaya, as well as ornamental plants and flowers. Many yards commonly have a washing sink, storage space, and bathroom or kitchen facilities outside that are separate from the house. It was also not uncommon to see chickens kept in household courtyards. Many of the lots originally had water and sewer utility hook-ups near the front of the lot and the majority of owners we visited moved services to the back of the lot, whether they were enclosed within or freestanding behind the house. The original design of La Presita, at a community scale, contributes to strong aesthetics and a well-built environment today. The original sites have grown into cohesive and vibrant streetscape. People have built nearly out to the edge of their property to the street, painted and decorated their houses and planted trees and vegetation in front. La Presita was originally designed to be accessible primarily for pedestrians and secondarily for auto traffic; though about fifty percent of those surveyed at the community meeting regret that there isn’t more auto access. The community has several main streets that are passable by car and the other through streets, because of their narrow width or stepped grade, are accessible only on foot. These pedestrian ways are still considerably trafficked and can support home-based businesses. Children play in all the streets. About half the houses in La Presita are situated on these through-streets. The rest of the houses in the community are clustered on interior cul-de-sacs or accesos, constructed as such to facilitate community building while also saving on infrastructure costs. The maintenance and character of these accesos are varied: some are paved with brick or asphalt, and others are still dirt. Some create park-like space, landscaped with trees in the median or in large planters, while others are used primarily for parking. Residents attribute the differences in the treatment of these spaces to the organization and attention of those living in the cluster. Those who made improvements collected money among residents to do so; most commonly to pave streets to keep them clean during the rainy season. Residents relate that adults don’t socialize much within their cluster, though they might have all originally built their houses together, and that children are the ones who most use the common open space. Families told us that public utilities were unreliable in the beginning, that the community was living in the middle of what still felt like agricultural land, electricity infrastructure was unavailable and streets were dark. Most families did their own wiring through a fuse box that ran into their house. Residents pay directly for utility services at a household level. Families purchased streetlights collectively in the beginning, each paying an assessment each month. (One woman mentioned that they risk severe penalties if they do not pay the monthly bill for street lighting.) Throughout the years, electricity service has been fairly stable, though service was often interrupted during war; someone related that there was a point in which water and electricity were off for 15 days straight. Water service has also been fairly consistent, but we visited one family that had built a cistern under the front yard and have used stored water when service was interrupted. Large infrastructure is still a concern. The community does not have a sewage treatment facility; sewer pipes drain directly into the river that borders the community, which in turn is polluted. When asked about the river, community members said that there should be a process for community participation to figure out options to clean it up. Some thought the area should be better defined by borders and could continue to be reforested where la Directiva had undertaken a small tree-planting project several years ago. The community was built on what was the edge of San Miguel in the late 1970s, though it is now well-served by private buses that operate to carry people back and forth to different destinations within the city of San Miguel. Residents recall that the community was very isolated early on and it took months before a man began operating a formal bus service between the community and the center of the city. There is a small plaza right at the entrance to the community from a main road coming from San Miguel. The plaza is surrounded by a community center, the school and a church. It was always crowded and seems to constitute the heart of the community. A large park on the other side of the community, by contrast, was deserted while we were there, full of trash, and its playground equipment in disrepair. La Directiva expressed that they have had difficulty finding funding to maintain the park, which doesn’t fall within the jurisdiction of any public entity. There are no houses that look out directly onto the park, and so it seems that such a large area, without any vigilance, and without an entity to finance and manage it, suffers from neglect. This is in contrast to the rest of the community where individual properties, if occupied, are very neatly kept. Members of la Directiva expressed similar difficulty keeping the wooded areas at the back of the community free of litter and protected against dumping. La Directiva also related a high incidence of informal appropriation of open “green zone” space by adjacent properties to expand lots. They have had little control over protecting public space, though it seems that this might provide a mixed remedy in keeping public spaces free of litter and blight. Some residents attributed this re-appropriation of open spaces for private use and parking as part of an effort to eliminate areas where gangs could congregate. At minimum, residents expressed that there should be clear information about the ownership of green spaces, even if they belong to people who live around them, the space should be well-defined and community members should still be able to access this space. There are no formal or informal recreation fields near the community; the closest soccer field is miles away within the city of San Miguel. Members of la Directiva estimate that about ten percent of the properties in La Presita are vacant. We noticed that vacant houses as randomly interspersed with otherwise occupied and well-kept houses on main streets. The only concentration of vacant houses was located on the outskirts of the community, in a cul-de-sac that borders a busy street and another, less desirable housing development. People tend not to sell their houses, and treat them less as a financial asset than housing for family, even if no one in the family is currently living in San Miguel and can occupy the house. As in much of El Salvador, many have immigrated to the United States to work. People attribute vacant properties to emigration more than anything. We heard of no mechanism established to transfer ownership when families might not return to the house or when there are no known heirs to a house. The lack of sales indicated to us the degree to which the value of a house in La Presita has appreciated and reluctance to let go of a housing opportunity that would otherwise be unavailable to people now. There is market demand for property in certain parts of La Presita. We talked to a contractor who was in the process of tearing down and rebuilding a house for a family that had just bought the property. The dramatic emigration trend certainly reinforces the poverty and lack of job opportunity that affects many families in La Presita. Many families also described a continued affordable housing problem in San Miguel, many have two or three generations living under one roof. People seem to live in larger households to better afford housing costs, as much for the lack of supply. There was considerable variation in the ways in which people had financed construction of their houses and what the houses had meant for them in financial terms. All families paid an initial down-payment on the house, a membership fee of $135 colones. There was an additional “cost” with the down payment, owners were required to collectively contribute time and labor in building the houses, usually on nights or weekends. For one woman we spoke with, this was a significant financial cost because she worked as a waitress on the weekends had to pay a laborer to work for her when she could not. Many homeowners talked about the economic sacrifices that they made to start their homes, but most said that upon moving to La Presita, their monthly housing costs went down, they might have been paying $50 colones each month to rent a tenement apartment in San Miguel, but their house payment in La Presita would only be about $30 colones each month. (As a point of comparison, the U.S. dollar was worth about 8 colones in 1990.) Families had mortgages held by Fundasal, that most paid off in about 10 years. Families were also restricted from renting or selling their properties for the first five years that they lived there. Nearly all respondents stated that the largest challenge in adding onto their homes was financial. In some cases, residents worked and saved money in order to make additions to their home. For example, one woman saved money for 2 years in order to build each additional room in her house. Over a period of 10 years, she was able to construct a 4-5-room house. In other cases, funding for additional construction came from remittances sent from children or other relatives living and working outside of El Salvador, typically in the US. In some cases, small remittances were saved over time in order to fund improvements, and in other cases, residents received one-time gifts from family members to make major changes to their homes. In some instances, families were extended credit or had access to loans to cover the cost of materials, but this seemed to occur only in a minority of cases. When asked about it, residents said that had loans or credit been available, they would have taken advantage of these to finance improvements. Most residents valued the house as a financial asset that helped them achieve economic security. Many residents we spoke to told us that the house provided a means for them to undertake some productive activity, like metal working, cabinetry, retail, tailoring, food preparation, etc. We saw many houses that used their front room for business activity, supported by the high volume of pedestrian flow throughout the community. Other residents spoke less of their house as a material asset, and rather as a source of stability and security for their families that made them better able to provide for their children’s health and studies. Again, houses in the community tend to stay within a family’s ownership. Even if the original owner is not living in the house, they usually rent it to a relative. In these cases, however, we found that non-owners are not likely to make improvements to the house because of financial constraints and the feeling that it wouldn't be a secure investment, as the owner could always sell the house. Somewhat paradoxically, the value of the house to original tenants may allow houses to fall into a state of disrepair. The houses that were in the best condition were typically those in which the owner lived and were committed and able to invest in the property. We found a wide range of monthly utility costs for families, from about $25 - 35 on the low end, to over $100 per month, for a man who had refrigerators running all the time to service the store in the front of his house. Electricity was the largest cost above water, gas, telephone or waste collection charges. Based on our own observations, resident interviews and survey responses, we saw several potential opportunities for short and long-term interventions in La Presita, as well as suggestions that might inform the planning of similar communities. Low cost credit, for more systematic upgrading of houses, timed to when families needed to make improvements and not when they acquired a large sum of money. There are cost and building inefficiencies, not to mention adverse quality of life effects, borne by households when building a house little by little. The financing could take the form of a revolving loan, or more conventional bank loans, even a process by which families could borrow against the value of their home to make improvements. Experience elsewhere suggests that a formal bank is the best mortgage holder, with lower defaults. Middle-income owners are most likely to have access to conventional bank loans, leaving lower income owners without such access. There have been obvious differences in income levels and income stability among residents of La Presita and so credit might be provided by diverse entities: an NGO such as Fundasal, la Directiva or a conventional lender, depending on the amount of the loan and the extent of the risk. Residents could show creditworthiness through previous mortgage payments and steady income. Despite lower incomes, La Presita could leverage the financial potential of nine hundred households in instituting even a small, unconventional fund. Also, given the magnitude of the remittances received by community residents, it is conceivable that the community could implement a mechanism for capturing a portion of these to capitalize a revolving loan fund to help families fund improvements, (or new home purchases, or community-wide recreation equipment). Obvious obstacles of trust in and governance of such a fund would need work. An effective mechanism for preservation of affordability and transition of ownership to new generations. La Directiva should consider establishing regulations governing vacant properties and to encourage a market for properties, possibly with subsidies for new buyers, to ensure that children of founders can stay in the community. New, lower-income buyers, don’t have the opportunity to buy a product similar to what La Presita was in the beginning, that is, to buy very affordably and upgrade housing incrementally (effectively extending the cost of their housing over twenty to thirty years). New buyers are instead faced now with an entire asset that they cannot afford. La Presita’s success has indirectly led to gentrification. We recognize that mechanisms preserving affordability might be hard to implement in a community governed by the informal economic sector and a weak system civil law. La Presita, however, had success with deed restrictions that required owners not to rent or sell the property for 5 years. Developers of similar communities should also think about longer deed restrictions or land trust arrangements to keep housing affordable. Since there isn’t a tendency to capture the financial value of the house through sales, a cap on resale value might not hurt a family’s asset and may induce them to save and build equity in other ways. It seems that there is little danger that families would not keep their properties up; people invested in their homes for the sake of livability there, which they intend to last for their lifetime. Perhaps they can recapture the marginal value of improvements through a land trust. Move utilities to back of lots in the beginning. Nearly all families moved utilities to the back of their lots from the front of each property, where they had been originally located to save on infrastructure costs. There would be large collective savings to individual families for this line extension at the beginning of construction (especially tearing out floors to lay new pipe) and families might pay for this premium in their original costs. They would still do the finishing plumbing themselves, but a line deeper into the property would have saved labor and the problems of imprecise plumbing. It may also have a public health benefit, the poorest families who were unable to move these services and had toilets right next to cook stoves at the front of the house. We understand that there was much debate in the beginning about the benefits of having contractors build a more finished house with infrastructure extensions or having participants pay in kind through their own labor-intensive building. Planners chose the latter as it was initially cheaper and lowered the monthly note, and would give families more flexibility in how they wanted their house to expand. Workshops, a revolving loan fun for financing, materials provided at low-costs to make houses earthquake-proof. Many families have had to make these improvements over the years. New developments should use the most sustainable technologies to protect against earthquakes. Planning and financing for major infrastructure improvements: La Presita faces an environmental crisis with the lack of sewage treatment facilities for the community and the human waste polluting the adjacent river. The World Bank should never have developed a community without a basic sanitation system in the first place. (“The original arrangement for sanitation was to have the City of San Miguel’s contribution for the sake of the World Bank loan be construction of "off- site" infrastructure: sewerage mains, trunk water lines, power, etc. In this case Fundasal was obliged by ANDA to dimension water and drainage pipes to the outfall point (along the river easement) where ANSA was to connect to and construct a collector to take the sewerage to a sewer treatment facility for the city of San Miguel. Obviously that never was done by government.” – George Gattoni, MIT ’73, designer of project with FUNDASAL) In order to mitigate this problem now, Fundasal and La Directiva should lobby for municipal financing or seek funding to make major infrastructure upgrades for sewage treatment. Fundasal could serve as a pass-through for an international development grant to support the implementation of major infrastructure improvements such as sewer treatment, reforestation of community edges, upgrading recreational facilities or resurfacing streets, all improvements that could already be in planning. However, as the sanitation systems were originally supposed to have been implemented by the city of San Miguel, the city ought to be held politically accountable for this and other major improvements, as residents pay municipal taxes. This would be a political challenge in a city with a resource-poor municipal government that has likely never taken care of its low-income neighborhoods. Better systems of leadership and administration at the community level. La Directiva is active and involved, but lacks the resources and planning capability to tackle major issues affecting the community. In a resource-poor country and city, funding capital improvements is difficult. Municipal services serve La Presita, and la Directiva should continue to organize politically for more effective governance and resources from the municipal government to counteract corruption, bureaucratic inefficiencies and neglect from the city of San Miguel. It might also be effective to give la Directiva smaller scale administrative and taxation powers to tackle community problems at a more effective micro-scale. Future planned communities ought to consider political governance more carefully. Fundasal’s design for La Presita was as much about building political organization and power as it was about designing housing and a community. The fact that major projects have been left undone without greater pressure on municipal government from the community casts doubt on the effectiveness of the model in this case. Simple urban design decisions go a long way. In general, street width and lot sizes were the initial design forms that achieved a successfully design community. Minimal urban design intervention didn’t seem to be needed beyond this. Simple codes governing setbacks, even if they did govern the development of La Presita, may not have even been relevant, because families built out to their property lines to maximize space. Small lots maximized the number of households in the community and encouraged families to build second stories when they were able. Limiting car access on some roads was a good original design decision, as a large number of the population cannot afford and does not own a car. It is obviously necessary to make some roads passable by car and there may be a way to design an alley system for deliveries, emergencies, and trash pick-up and to accommodate those who do own vehicles. However, keeping road coverage to a minimum increases the amount of space available for housing, and keeps the streets safe for pedestrians, and non-motorized transit. Transportation Systems: Though the community is today well-served by private buses, it was isolated in the beginning. Fundasal or other developers engaged in building these types of communities should push at the planning stage for systems of public transport that better link these communities with jobs and access to centers of commerce and industry. Better-designed and more integrated public spaces: The community’s plaza is small and poorly designed. We think had it had been larger with a more open layout, it could have accommodated more economic and recreational activity. It is also situated at the edge of the community and generally the neighborhoods closest to the plaza are in better condition and of a higher value than those further away. If the plaza were more centrally located, it could spread these value effects to more of the community. Since the other significant public space in the community, the park, was a threatening space in complete disrepair, it seems the two uses should be paired together, so that more people would use and care for the recreational area. Future communities might consider allowing space for soccer or other recreational fields. While it is hard to trade off housing for these uses, it would contribute immeasurably to quality of life, especially for youth in a community with considerable gang influence. There should also be mechanisms to maintain these places, whether the city could appropriate space into a municipal park system or la Directiva would be able to collect very small assessments to keep these areas well maintained. More commercial space? Site plans for new developments might accommodate more commercial space as a source of economic development for the community. This could include designing for storefronts in early stages of the communities’ development, or to plan to have certain sections of the community laid out for market space or larger retail or small industrial buildings. In La Presita, large non-commercial uses like the school, church and community center, occupy a lot of land space in the plaza that would be valuable for commercial activity. So much economic activity goes on in a community like La Presita through home based businesses and retail, that it might benefit future communities to intensify this use through the built environment, and to keep economic profits in the community and perhaps bring in more business from the surrounding city. Mind the Edges: The boundaries of the community should be carefully designed. We found that the edges of the community, bounded by the highway or the river, were more likely to have vacant property or be controlled by gangs. The more the community is designed to have permeable boundaries to other neighboring communities or a reduction in the number of isolated edges, the better for the community. Adverse effects of vacant properties? An opportunity for further research concerns the relationship between individual properties on the same block. Individual homes didn’t always seem to be affected by the condition of adjacent homes. We observed houses with dirt floors in the same cluster as two-story homes with finer finishes. It would be interesting to know much have abandoned and/or vacant houses posed a problem for other houses on a certain street? Would intervention to secure and re-occupy these properties benefit the rest of the community? Mechanisms to sustain a strong tradition of community interdependency: Since a majority of the residents interviewed and surveyed were of the older generation, we gained an interesting, though one-sided impression of the state of the social side of the community. To them, training and community organizing were effective at the front end, but weren’t easily sustained. A key intervention for La Presita now is to engage new generations of families in the history and culture of the community, quite possibly in a participatory way where new community social goals could be identified, prioritized and organized around. Perhaps this is part of the curriculum and socialization that takes place within the schools in the community. We would like to thank the Fundaciòn Salvadoreña de Desarrollo y Vivienda Mìnima (Fundasal) for generously providing information about the La Presita community, and in particular their staff Mario Flores, Hernesto Martinez, and Jorge Manuel Henriquez who guided the survey teams. Above all, our deepest gratitude to the community and leaders of La Presita, whose hospitality enabled us to learn their 'success secrets' in constructing their homes.